I didn't see anything move until the very end when the whateveritwas slowly faded away. Has NASA or anybody said anything about it? Thanks Auntym! I shared this with our middle-school science teachers! Russia is to deny the US future use of the International Space Station beyond 2020 and will also bar its rocket engines from launching US military satellites as it hits back at American sanctions.These were imposed over the recent and now continuing Ukraine crisis. Russia’s deputy Prime Minister Dmitry Rogozin announced a series of punitive measures on Tuesday against the US in response to sanctions imposed after Russia annexed Crimea. The two countries have long cooperated closely on space exploration despite their clashes in foreign policy. The Space Station is manned by both American and Russian crew, but the only way to reach it is by using Russia’s Soyuz spacecraft. The US is keen to keep the $100 billion (£600) ISS flying until at least 2024, four years beyond its original target. Moscow’s response would affect NK-33 and RD-180 engines which Russia supplies to the US, Mr Rogozin said. “We are ready to deliver these engines but on one condition that they will not be used to launch military satellites,” he said. RD-180 engines are used to boost Atlas 5 rockets manufactured by United Launch Alliance, a partnership of Lockheed Martin and Boeing that holds a virtual monopoly on launching U.S. military satellites. Mr Rogozin said Moscow was planning “strategic changes” in its space industry after 2020 and aims to use money and “intellectual resources” that now go to the space station for a “a project with more prospects”. He suggested Russia could use the station without the United States, saying: “The Russian segment can exist independently from the American one. The U.S. one cannot.” The US space agency NASA is working with companies to develop space taxis with the goal of restoring US transport to the station by 2017, but the United States currently pays Russia more than $60 million per person to fly its astronauts up. This is not the first time that the ISS live camera feed has captured what appears to be a large UFO in the vicinity. Back on January 29, ISS live streaming showed what appeared to be a sleek elliptical UFO docked with the hull of the International Space Station. The object was between the Russian research module and the Soyuz escape capsule. Its size was approximately 10 meters. Some claimed that the UFO was related to an ISS ceremony featuring the Olympic flag. Yet the ISS ceremony was held in November 2013, and the flag was only about a meter in size, far smaller than the estimated 10 meter UFO. Breaking UFO News Massive Alien Ship Visits ISS!!! Enhanced Video! Toby Lundh Shares Incredible Live Feed Footage Of a Large UFO Next To The International Space-station! The new Ham TV, equipment pictured here, adds a visual dimension, allowing an audience on the ground to see and hear the astronauts. Astronauts on the International Space Station (ISS) can now talk with people on Earth with video using simple transmitters. ‘Ham TV’ has been set up in the European Space Agency’s (ESA’s) Columbus laboratory and already used for talking with ground control. Amateur radio enthusiasts have been able to poll astronauts circling our planet using standard radio equipment since the space station was inaugurated in 2000. Radio signals easily reach the orbital outpost flying about 220 miles (350 km) above us on sets readily available to radio enthusiasts. The new Ham TV adds a visual dimension, allowing an audience on the ground to see and hear the astronauts. The hardware, developed by Kayser Italia, was sent to the space station on Japan’s space freighter in August last year and connected to an existing S-band antenna on Columbus. NASA astronaut Mike Hopkins had the honor of being the first to commission the unit and broadcast over Ham TV. He had a video chat with three ground stations in Italy: Livorno, Casale Monferrato and Matera. The crew finished commissioning the set-up on April 12 for general use. Just like standard television, the video signal is one way. The astronauts cannot see their audience but they will still be able to hear them over the traditional amateur radio on the space station. Contacts are brief – the connection requires direct line of sight and the space station’s 17,500 mph (28,800 km/h) means it quickly passes through the field of view of amateur stations. ESA has provided five ground antennas and equipment to the Amateur Radio on the International Space Station organization to receive video from the station. These stations can be transported easily and positioned to follow the laboratory as it flies overhead. Linked together in this way, the stations can supply up to 20 minutes of contact at a time. Ham TV will add to ISS Ham Radio for space educational purposes, offering schoolchildren the chance to talk and see astronauts in space with simple equipment. Anybody can still hail the station via radio and, if an astronaut floats by the always-on receiver, they might just pick up and answer the call. For more information on how to get involved and organize an educational event, contact the Amateur Radio on the International Space Station organization. This original story was written and published by the European Space Agency on May 5, 2014. Did you know there's a live HD view of space on the ISS, streamed to the world? No Audio = Normal. There is no audio on purpose. Add your own soundtrack. June 6, 2014 – In a mirror universe right now, an alternate Steve Swanson is wearing a space patch bearing the logo of the fictional Klingon Empire. In this reality, NASA jettisoned the astronaut's "Star Trek" inspired emblem before it could reach space. 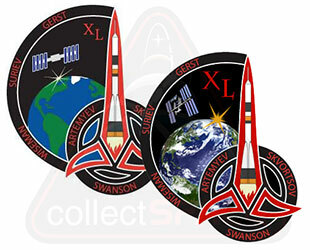 Swanson, who currently is commander of the International Space Station, collaborated with his daughter to create an insignia for the outpost's Expedition 40 crew. What he and his fellow astronauts and cosmonauts ultimately launched with to the space station was a patch depicting the "past, present, and future of human space exploration." What Swanson had first proposed however, was a badge of a decidedly different type. "He wanted something that was kind of badass," revealed Mary Swanson, Steve's wife, in a call with collectSPACE, "and Klingons are kind of badass." Steve and Caroline Swanson's original idea for the patch derived its shape and trefoil logo from an emblem created for the Klingon "Brotherhood of the Sword," as seen on the 1990's television series "Star Trek: The Next Generation." "Steve grew up watching 'Star Trek,'" Mary explained. "We watched reruns early in our marriage. We watched 'Next Generation' pretty religiously. So, yeah, he is somewhat of a fan." Swanson and his daughter, a computer science major who began her studies in graphic design, modified the Klingon patch, replacing its image of a sword-like weapon called a "Bat'leth" with a similarly-shaped icon depicting the space station. A Klingon language inscription along the border of the original emblem was supplanted by the Swansons with the names of the six-person Expedition 40 crew. 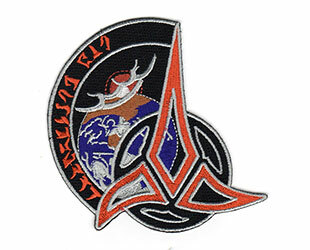 The Klingon logo from the original patch was also altered to envelop a Russian Soyuz rocket, like the type Swanson and his crewmates used to launch to space. Swanson, together with cosmonauts Alexander Skvortsov and Oleg Artemyev lifted off for the station in late March. They were joined on orbit by Reid Wiseman of NASA, Max Suraev of the Russian federal space agency Roscsomos, and Alexander Gerst with the European Space Agency on May 28. The two three-member Soyuz crews departed the planet from Russia's Baikonur Cosmodrome. In the original 1960s "Star Trek" series, the Klingons were created as an allegory for the Russians, the threat of the Klingon Empire evoking the Cold War with the then-Soviet Union. ESA's Alexander Gerst sewed another star representing a World Cup win onto his German jersey after the country's team won the 2014 FIFA tournament. Wednesday, July 16, 2014: Astronaut Alexander Gerst tweeted this photo of himself in the International Space Station on July 13, 2014, as he celebrated Germany's 2014 FIFA World Cup Final victory over Argentina. He wrote: “Just like our @dfb_Team_EN [German Football Association] I have fantastic support from my crew. Congrats from #ISS to the #WorldChamp. Great game! pic.twitter.com/sw4gGbtvwh” Gerst’s fellow astronauts, Reid Wiseman and Steve Swanson, "hoist" him in the air. For a German astronaut living in space, his home country's epic World Cup victory this week was quite literally out-of-this-world. European Space Agency astronaut Alexander Gerst and his crewmates watched the World Cup final from the International Space Station on Sunday (July 13) as Germany defeated Argentina to win the 2014 FIFA World Cup in Brazil. Gerst is currently the only German (and only European for that matter) living in space, and he wore his country's jersey during the match. Well, The Thing — or at least one of its tropes — jumped the fence at NASA’s Johnson Space Center this week and went global when a camera aboard the International Space Station apparently recorded unidentified images outside the craft. The blogger who noticed and posted — Scott Waring of Taiwan — is an old hand at combing through NASA stills and footage. At his UFO Sightings Daily website, entries are interpreted by text like “NASA Photo is proof of Apollo 20 mission,” “Buildings On Mercury in NASA Photos,” “Alien Pyramid Found On Asteroid RQ36,” and “Alien Structures On Saturn's Moon Iapetus.” For whatever reason, the mainstream media pretty much ignores these scoops. And then. One day later. Tuesday. The New York Daily News. Reported a third ISS/UFO video had surfaced. In this one, four dim lights in diagonal formation are shown dimming out beyond the space station. And it’s either beneath NASA’s dignity to comment on mystery skank or nobody’s even bothered give ‘em a buzz. The Washington Times weighed in on Wedneday. Again, no NASA feedback. Granted, none of the aforementioned media got famous for their high-brow sobriety. But they're reaching large audiences and today, even CNN piled into the scrum. With a mixture of snark and bewilderment -- and still no NASA voice -- its online piece concluded: "Though it may seem these advanced beings have accomplished much right in our neighborhood, they haven't learned not to fly within eyeshot of a space station the size of a football field (including the end zones)." Could the space agency have prevented The Thing from going viral? Probably not; authority-figure prophylactics ain't what they used to be. But with the MSM beginning to catch the scent, De Void left messages with the ISS ground-support team at JSC a few days ago. Still no reply. Which is kind of a shame because it gives sensationalist bloggers a license to dream up any kind of irresponsible headlines they want. Scientists aboard the International Space Station (ISS) have been left stunned to discover extra-terrestrial life in outer space. They are stumped as to how to they got there but claim studies support the ability of the extra-terrestrials to exist in zero gravity, extreme temperatures, while being belted by cosmic radiation and despite a lack of oxygen. The team of Russian experts stumbled across the startling find during a routine cleaning and polishing mission of the outside surface of the ISS. “Results of the experiment are absolutely unique.” said the chief of the Russian ISS orbital mission Vladimir Solovyev, according to a report by Itar-Tass news agency. Using "high-precision equipment”, the team apparently made the discovery during a routine cleaning operation. "This is particularly needed during long space flights," Solovyev said. "This is not typical for Baikonur. It means that there are some uplifting air currents which reach the station and settle on its surface," he was quoted as saying. America has always been a nation of tinkerers, inventors, and entrepreneurs. In recent years, a growing number of Americans have gained access to technologies such as 3D printers, laser cutters, easy-to-use design software, and desktop machinery. These tools are enabling more Americans to design and make almost anything, and the applications to space exploration will help our astronauts to be less reliant on materials from Earth as they explore farther out into the solar system. The 3D printer prints a common part that is used aboard the space station. NASA in conjunction with the American Society of Mechanical Engineers Foundation, has issued a series of "Future Engineers" 3D Space Challenges for students focused on solving real-world space exploration problems. Students will become the creators and innovators of tomorrow by using 3D modeling software to submit their designs and have the opportunity for their design to be printed on the first 3D printer aboard the International Space Station. The winning student will watch from NASA’s Payload Operations Center with the mission control team as the item is printed in space. NASA’s 3D Printing in Zero-G ISS Technology Demonstration will demonstrate the capability of utilizing a Made In Space 3D printer for in-space additive manufacturing technology. This is the first step toward realizing an additive manufacturing, print-on-demand “machine shop” for long-duration missions and sustaining human exploration of other planets, where there is extremely limited ability and availability of Earth-based logistics support. If an astronaut tool breaks, future space pioneers won’t be able to go to the local hardware store to purchase a replacement, but with 3D printing they will be able to create their own replacement or create tools we’ve never seen before. For NASA as well as the Maker community, 3D printing provides end-to-end product development. The "ISSPresso" machine, which is scheduled to arrive at the International Space Station in April 2015 to make high-quality coffee for astronauts. Water enters the machine through the bottom bag, and coffee is pumped into the upper bag. TORONTO — Moments after David Avino turned on an espresso machine in the middle of the International Astronomical Congress exhibition floor here Monday (Sept. 29), more than a dozen bystanders stopped in their tracks to watch it brew. The machine — called ISSpresso — is a prototype similar to one that will fly to the International Space Station in April 2015 aboard Orbital Sciences' robotic Cygnus cargo vessel. It will take astronauts only minutes to set up ISSpresso on the orbiting lab — all they'll need to do is take out the box, secure the machine to the wall with bungee cords and get some water in a standard pouch. And then astronauts can enjoy some espresso with their space food. Only a minute after Avino turned on the machine, coffee began filtering into the pouch. When the pouch was full, Avino offered samples for people to sip. Beside him, Lavazza USA CEO Ennio Ranaboldo said the machine is already attracting attention at NASA, even from Administrator Charles Bolden, who stopped by the exhibition floor earlier Monday — which was, appropriately enough, International Coffee Day. "People were dragging him away," Ranaboldo joked. The first International Space Station component, the Russian Zarya module, was launched in November 1998. In the 15 years since, NASA and its global partners have built a world class orbiting laboratory, establishing a continuous human presence in space since 2000 and paving the way for future exploration beyond. We're celebrating this milestone with an infographic showcasing some of the amazing and surprising facts about humanity's home away from Earth, but there's much more to learn. For the latest news, features and videos from orbit, visit www.nasa.gov/station. You can also find out how to see the station yourself at spotthestation.nasa.gov or watch live station video at www.nasa.gov/iss-stream. This breaking news story is being updated. NASA Chief Bolden gave Congress a reality check and scolded them for their poor judgment. Congress from 2009 to 2014 has not allocated sufficient funds to NASA and as a result may have made the costliest biggest mistake of the century. The Space Shuttle was retired under President George Bush and Congress has not supported an “AMERICAN Alternative” but a Russian one. Americans could have had good paying jobs to help build the space rockets needed for NASA but Congress opted to pay millions to Russia for tickets to the ISS. Russia and American relations have gone critical stage and Congress was told by NASA chief were screwed. No Russia means no ISS. America has no alternative but to abandon the ISS if Russia decides it doesn’t want to play with us anymore. I will not be surprised if Putin decides to abandon the ISS right before the private company Space X is ready for launch. It would be the ultimate disastrous blow to America’s space program and would reveal to the world America’s weakness in space when Russia and China advance ahead of us. Congress sits and blames everyone but in reality this is a result of US politics at their worst. Russia has decided to build its own space station but gave a commitment to continue to 2026. We know commitments can be broken. Putin is holding the ISS as hostage thanks to Congress idiocy. The Space Shuttle should have never been retired without a replacement and why didn’t we give Americans the jobs to build our own space ships. American space exploration would end. We wouldn’t be in this fix if Congress financed NASA. Bolden told Congress that if Russia stopped taking our astronauts up then he would have only one thing to do. He would evacuate the ISS and it would lie abandoned in space. Mars exploration is not feasible if we can’t get to our space station. Who is kidding who? Putin holds the winning cards. Congress has let America down. Hopefully it won't happen. But I get mad every time I think of the way they killed the shuttle without a replacement. The most sophisticated space robot ever built, Dextre is a space handyman with a mission: keep the International Space Station (ISS) ship-shape. Dextre's role is to perform maintenance work and repairs like changing batteries and replacing cameras outside the ISS. Having Dextre on call will reduce the amount of risky spacewalks to do routine chores, thus giving astronauts more time for science, the main goal of the ISS. Dextre's special skills and awesome location also offer a unique and opportune testing ground for new robotics concepts like servicing satellites in space. Dextre can ride on the end of Canadarm2 to move from worksite to worksite, or simply hitch a ride on the Mobile Base. A veteran NASA employee says he saw a nine-foot-tall alien hitch a ride on the space shuttle – and watched the event when it thought no one was looking. UFO sites have seized on this as CONCLUSIVE EVIDENCE that there is a vast, global conspiracy where our leaders are in league with aliens. Clark C. McClelland makes the claim in a video recently unearthed by paranormal news site Inquisitr. He claims to have worked at NASA for 35 years, including work on the Apollo missions – and in his favour, no one has stepped forward to say he didn't. There’s also a picture of him actually ON the Space Shuttle, which is conclusive enough for the UFO sites. McClelland says he was monitoring a Space Shuttle mission from Kennedy Space Centre when he saw something he wasn’t meant to – namely a gangly, slender alien chatting away with two astronauts in the Space Shuttle’s payload bay. He also saw an alien ship ‘parked’ nearby. Disclaimer: many people think McLelland is nuts. Second disclaimer: UFO fans believe, of course, that this first disclaimer is disinformation, spread by the Men in Black. McLelland says, ‘I know an ET and Alien craft when I see them. ‘Aliens are here on Earth, they walk among us. They may have been implanted into our various Earth governments. His website, entitled Stargate Chronicles, is, shall we say, an interesting read. The video below has garnered over 324 thousand views. Check it out. Remarkable testimony has emerged from a former nasa employee who claims to have witnessed a nine foot tall extraterrestrial humanoid during a routine space shuttle mission. Anunnaki? 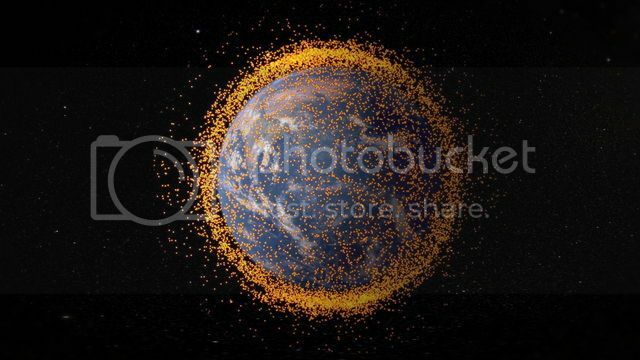 NASA researchers suggest that nearly 3,000 tons of space debris reside in low-Earth orbit, including derelict satellites, rocket bodies and parts and tiny bits of wreckage produced by collisions involving larger objects. (Might these be the source of all the "UFO reports" around the space station?) Impacts from pieces of junk that are only the size of screws can still inflict catastrophic damage on satellites, since these projectiles can travel at speeds on the order of 22,370 mph (36,000 km/h). EUSO was originally developed to detect ultraviolet light produced by ultrahigh-energy cosmic raysas they enter the atmosphere at night. The scientists reasoned that its wide range of view and powerful optics could also help it detect high-speed debris near the International Space Station. Sounds troublesome to me. Metal doesn't 'burn-up' but rather it changes form, and they're talking about 'vaporizing' a lot of metal and other stuff too. Where is it all gonna go? Into our atmosphere. And then, ever been to a big out-door party where a lot of folks are dancing with 'high-power' hand-LASERs? Those little LASERs only beam-out a couple of Watts, imagine catching a glint from high in orbit from a 100,000 Watt LASER, a splinter of its beam bouncing off your eyeball. And its UV too!! So it'd be a bit like an instantaneous sun-tan...errr sun-burn on your eye-balls. I don't know?? Not sure that's such a great idea. Surely those imbeciles wouldn't fire it at the planet...would they? Right about 1982 when I was 14 or 15 (somewhere between 81 - 83 ), I was looking up at the stars on our way to the San Juaquin river in Cali. I knew the constellations fairly well at this time. I saw two objects traveling quickly on the same trajectory, one following the other. The object from behind which was chasing the other emitted two blue projectiles at the leading target. It disintegrated and expanded outwards in a round blue hue from the first projectile that struck it. I think using this technology to ( clean up ) the mess weve made is a good thing. Having the capability to prevent incoming ballistics is even better. 1982 was an awful long time ago for the Feds to be testing laser cannons. I don't think we even had lasers back then did we? Do you remember Star Wars (SDI) ? Maybe the Galactic Federation was protecting us from something else ? I don't doubt for a second that we have weapons up there somewhere. We put them everywhere else. It wouldn't surprise me any if a lot of that garbage up there turned out to be the remains of satellites that different countries blew up. Whoever controls orbital space would have a huge amount of power.